The holiday season is approaching! Although the holidays are supposed to be the “most wonderful time of the year,” many adults find the holidays stressful, with gift-giving topping the list. As a small business owner, you have the extra burden of selecting gifts for your customers, employees, and service providers. Making these decisions can induce headaches, so we’ve compiled some guidelines and tips to ease the pain of selecting holiday business gifts. Choosing gifts for clients, employees, and service providers can be challenging. Balancing budget and time constraints with thoughtfulness and appropriateness isn’t easy. These guidelines will keep you on the right path. Avoid gifts that are too personal or can be misconstrued—such as lingerie, perfume, or jewelry. Avoid giving gifts if you’re involved in a bidding process—whether someone wants to do business with your company or vice versa. Avoid giving cheap promotional items with your company’s logo on them. These “gifts” are seen as advertising and are insulting to receive. It is better to give no gift than a cheap, thoughtless gift. If you use a company logo on business gifts, make sure it is tastefully done and doesn’t look like an ad. Be aware that many companies have policies on the amount and types of gifts that employees can accept. Expensive gifts may be prohibited or put the gift recipient in an uncomfortable position. If you have doubts, consult with the HR department for guidance. Most companies permit employees to accept token gifts, usually valued at $25 or less. Be sensitive to religious beliefs. Not everyone celebrates Christmas! Although December is a traditional time for gift giving, make sure the sentiment and gifts are appropriate for everyone. Many businesses focus on the new year to keep things more general. For example, thank customers for their business during the past year and your hope for a continued relationship in the new year. Your company’s finances will determine the gift budget. If your bottom line isn’t healthy, don’t feel obligated to give gifts—that isn’t good business! A thoughtful, hand-written card expressing your thanks is acceptable and has more value than a generic box of candy. Most companies start with a set budget amount to spend on gifts. In this case, the amount spent per gift will be determined by how many gifts need to be purchased. For example, suppose your gift budget is $1,000, and you’ve decided to spend $500 on employee gifts, $400 on customers gifts, and $100 on service providers. You would now create a list of everyone in each category who will be receiving a gift. Be sure to write it down. Don’t rely on your memory alone! You then divide the budgeted number by the number of recipients in each category to get a price range for gifts. When determining the cost of the gift, remember to include the costs of customization, tax, wrapping, tags, cards, shipping, and delivery. It adds up quickly! You can deduct no more than $25 of the cost of business gifts you gave directly or indirectly to each person during your tax year. A “one size fits all” budget may not always work. You may want to adjust gift amounts depending on the relationship. However, use caution with this approach, especially when giving gifts to employees. For more detailed guidance, see the tips sections below. $25 to $100 gift amount for clients who gave less than $10,000 in business. Other factors include how long you’ve been in business with the client and how many times they have referred your company. When choosing a gift for your most important clients, use information you’ve gathered during the relationship to select a personalized gift. Do they play golf? Perhaps a golf-related gift is appropriate. Did they mention being a fan of a local sports team? Maybe tickets to an upcoming game would be a good choice. The thought and personalization accompanying a gift are as important as the gift itself. Be sure to include a handwritten card or gift tag with the gift. In-person delivery is another way to show your commitment to the relationship. A greeting card with a gift-like item, such as a calendar. Be creative and have fun with it! The gift substitute is meant to thank your customers for their business in a meaningful and thoughtful way. Most employees expect a token of appreciation near the holidays. For employee gifts, the key is to give the same gift or similar gifts of the same value to avoid perceptions of favoritism or unfairness. Employees will talk amongst themselves! One solution is to give bonuses, which most employees prefer to a gift. Bonus amounts can vary depending on the employee. Also, bonus amounts are confidential because they are considered to be compensation. If you don’t have the budget for employee bonuses, give a gift that appeals to everyone, such as a gift certificate to a nearby lunch spot or a gift basket filled with goodies. Just be sure the value is the same for everyone! A personalized card expressing thanks and appreciation should be included with any gifts. Take a moment to recognize hard work and dedication to the company—employees will appreciate it! Service providers include the people who provide services to your company on a regular basis—postal workers, UPS or FedEx drivers, janitorial services, virtual assistants, consultants. Be sure to make a list to ensure that you don’t forget anyone. The gift amount will depend on your relationship and what type of services they provide. For example, a gift for a consultant will be more generous and personalized than the gift for your UPS driver. Most delivery drivers cannot accept cash or gifts outside specific ranges. If you’re giving to a group rather than an individual (such as a cleaning crew), give a gift that can be shared, such as a basket filled with goodies. Again, a handwritten card expressing your appreciation should be included, with or without a gift. Even if the physical gift is small and unassuming (such as a small bag of coffee or box of chocolates), include a personal note with it. 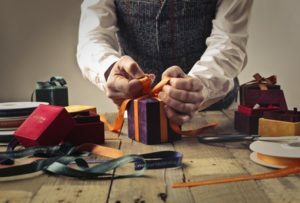 Hopefully, this article will help reduce your stress as you navigate the tricky task of giving business gifts. Remember, the most critical part is to express your thanks and appreciation in a thoughtful note. The gift itself will depend on your budget and relationship with the recipient. However, the heartfelt sharing of your thanks and appreciation is free and always of value.